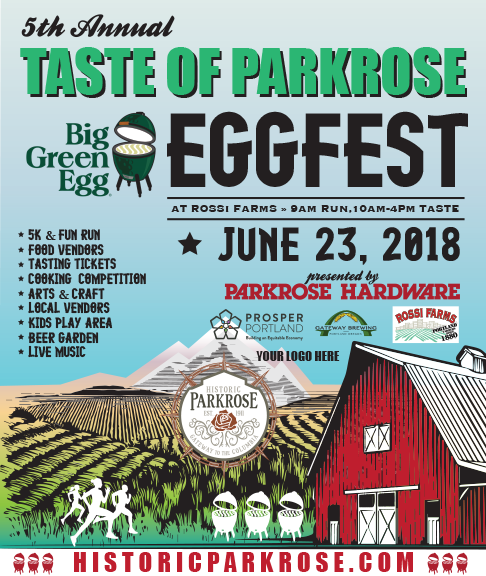 Join us in celebrating the 5th Annual Taste of Parkrose Eggfest, sponsored by Parkrose Hardware, Prosper Portland, and Gateway Brewing! The Taste of Parkrose 5K Fun Run is the first of many exciting events held during the Taste of Parkrose fair. This year’s course will take runners from Rossi Farms through the new Luuwit View Park, and then back to Rossi Farms for a day of fun! Proceeds from the Fun Run will benefit the Parkrose High School Cross Country Team. COUNTDOWN UNTIL THE 2018 TASTE OF PARKROSE! Support the NEW PARKROSE STREET MURAL at Panera!